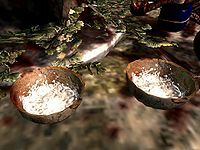 Salt Piles are potentially more valuable for cooking than for alchemy, since salt is a necessary ingredient in most cooking recipes. Accordingly, it is categorized as raw food as well as an ingredient, meaning it can be traded with innkeepers as well as apothecary merchants. It cannot be harvested in Skyrim. Nearly all innkeepers and apothecary merchants are guaranteed to sell 1-6 salt piles. In addition, salt can commonly be found in many containers. Fish barrels always contain 1 salt pile, as do certain barrels that are internally identified as meat barrels. Standard food barrels and most small sacks have a 40% chance of containing 1-3 salt piles. Ten recipes consist of combining a raw meat with salt, yielding cooked versions of the meat, namely cooked beef, grilled chicken breast, horker loaf, horse haunch, leg of goat roast, mammoth steak, pheasant roast, rabbit haunch, salmon steak, and venison chop. Two meats, beef and venison, can also be combined with vegetables as well as salt, yielding beef stew and venison stew. Vegetarian options that require salt are apple cabbage stew, cabbage potato soup, and tomato soup. It can be combined with a soul gem and a regular gem to create fire salts, frost salts, or void salts. It is one of 4 items needed to create a Spell Tome: Soul Trap. There is a second variety of salt pile (00074a19, weight 0.2, value 1 gold) which shares all the same alchemical properties as a regular salt pile. Its only location is in Black-Briar Manor in Riften, but it cannot be reached without the help of console commands. Esta página foi modificada pela última vez à(s) 06h27min de 10 de dezembro de 2012.